Skin has a soft and luminous glow this season courtesy of Bobbi's newest Shimmer Brick, part of her Platinum Collection. Five color bars-soft pink, platinum, bright pink, golden coral and rose-blend together to light up the face. 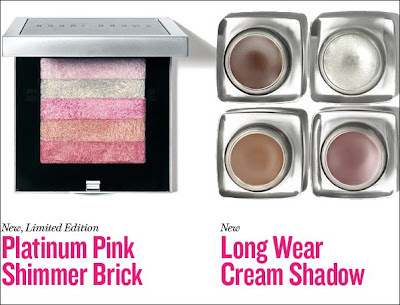 These shades work beautifully as highlight colors for cheeks or anywhere you want to add shimmer. The special platinum bar is a great new shade for eyes. Custom-made compact features a metallic silver finish and faux-leather detailing. Available for a limited time. Eyes this spring are strong and smoky with cool shades of velvety-smooth Long Wear Cream Shadow. This award-winning formula lasts all day without creasing or smearing. Safe for contact lens wearers. Ophthalmologist tested. Fragrance free. Infused with pink and platinum pearls, this shimmering body oil gives skin a radiant glow as it moisturizes and conditions with a blend of essential oils. Lightweight formula absorbs quickly into the skin leaving it soft to the touch. Lightly fragranced with Bobbi’s Party, a new scent debuting Holiday 2009. This Fragrance has top notes of Violet Leaves, Lemon Flower and Lily of the Valley. A sophisticated yet fun fragrance. 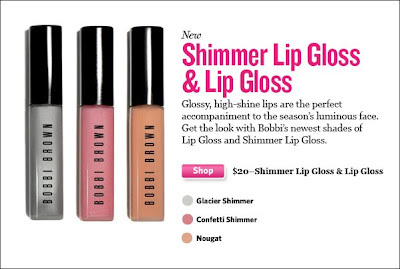 Lipgloss: Glossy, high-shine lips are the perfect accompaniment to the season's luminous face.